Journey Snacks is a brand owned by Journey Snacks, LLC based out of Lake Ozark, MO. The brand launched in 2017 by a group of friends who wanted to market exceptional beef jerky to the world. The brand currently sells from their website and a few retail locations around the State of Missouri. They currently only offer this one flavor marked as, "Original", with the only descriptions of, "fully cooked", "simple, delicious, and healthy", "real beef jerky", and "handcrafted in Missouri". The first flavor that comes into focus is salt, followed quickly by real wood smokiness. The garlic and onion seasoning walks into the picture, along with hints of soy sauce. The chewing brings on the natural meat flavors along with a more defined smokiness. Looming in the background are faint hints of worcestershire. For being described with words like "real beef jerky" and "simple, delicious, and healthy", it actually does stand up. 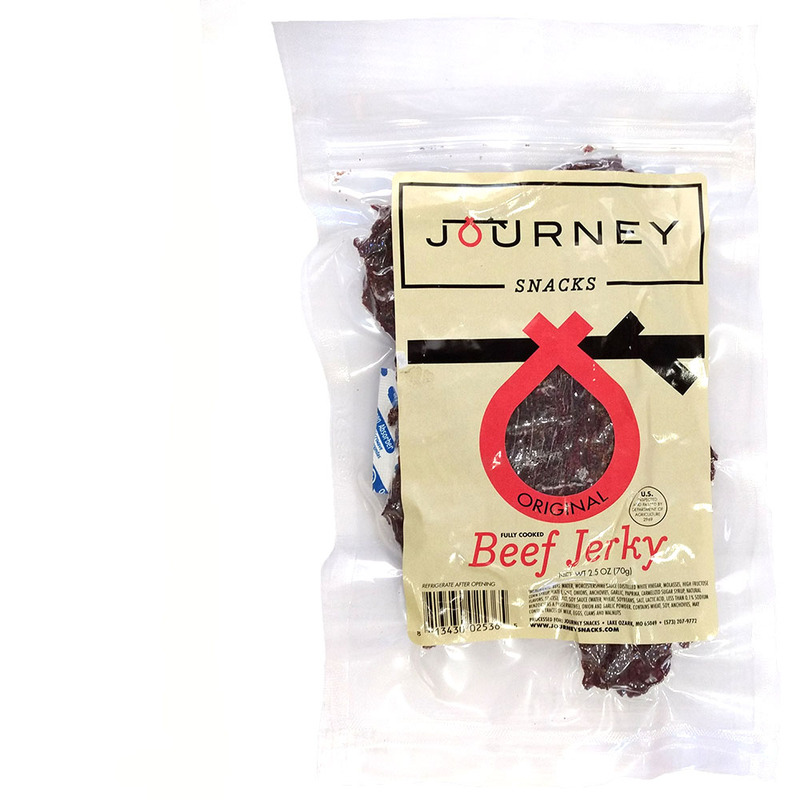 This jerky has a flavor, feel, and texture reminiscent of something homemade, or something made the old fashioned way. 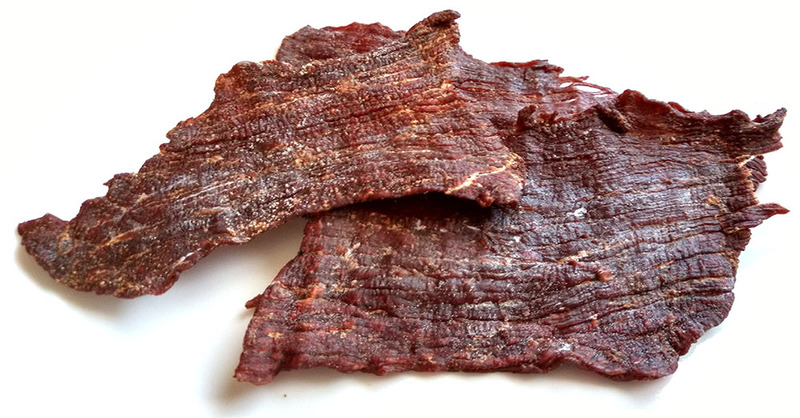 I think much of it is due to the lack of added sugar (aside from what's already in Worcestershire), but also the real wood smokiness and the simple ingredients contributes to this jerky's fresh, natural character. Otherwise, the primary taste profile is a well-brined, garlic and onion seasoning with a prominent real wood smoke. A natural meat flavor comes on in the chewing. The soy sauce remains faint, just enough to let in its subtleties, and an even more faint Worcestershire in the background. The meat consistency is excellent. Though dry and woody, it's actually easy to bite off pieces and there's a light crunch in the initial chewing. Once chewed down, it takes on the texture of a well-done cooked steak, though a bit on the crumbly side. I found no stringiness and no unchewable matter. 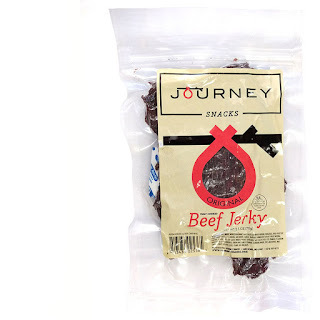 This Original beef jerky from Journey Snacks does a great job of delivering a more natural, fresh character through its real wood smoke flavor, lack of added sugar, and simple ingredients. It is however, quite salty despite its nutrition label showing a moderately-low 300mg of sodium per ounce. But with a cold beer or bottle of water in hand, these slices of brined beef are hard to stop eating for their smokey natural meat flavor and their easy, lightly crunchy, chewing. Their extremely low 50 calories per ounce (150 calories for an entire bag), and the lack of added sugar, makes it a great dieting snack if you can limit the liquid chaser to just water. 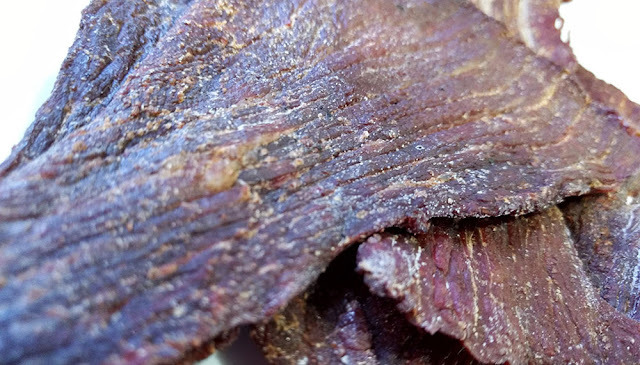 Overall, we're really impressed with how snackable this jerky is despite its simple ingredients, and perhaps it's a testament to how good simple, old fashioned style jerky can be.